Give life to your headphones with this multi-purpose combined headphone amplifier and DAC which features a sampling frequency of up to 32 bit and an understated and sleek casing. 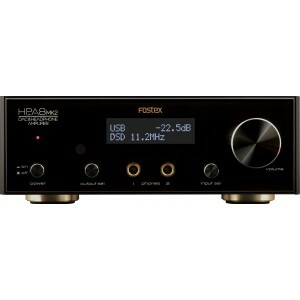 Fostex HP-A8 Mk2 Headphone Amplifier + DAC is a high-calibre, easy to use combined model that truly brings life to your headphones. Kick back and enjoy top quality digital sounds from your computer or any other digital audio device. The HP-A8 Mk2 showcases a 32-bit DAC alongside subtle circuitry within a sleek and aesthetically pleasing construction.Thanks to its bespoke USB driver, the model supports a sampling frequency of up to 32 bit/ 192 kHz. Jitter is eliminated from the model thanks to the utilisation of a crystal oscillator in the asynchronous mode. Input sources can be provided by computers, digital and analog audio devices. The model can play DSF files, WAV files and AIFF files on an SD (SDHC) card directly by utilising the built-in SD (SDHC) card drive. This drive is future-proof for upcoming updates. The HP-A8 is excellently versatile as both the external and the external clock are available for the master clock, alongside being equipped with an RCA pin jack output. The headphone output is improved by 24 level gain settings, while the model also enjoys a switchable digital filter. Sound clarity and accuracy is increased as analogue output does not directly pass through the volume.